In 2017, high and fluctuating water flows, unprecedented for their duration, passed through the Sacramento and Feather Rivers. Orchards were hurt by these flows due to direct flooding, indirect flooding via under-levee seepage, and loss of land through river bank erosion. 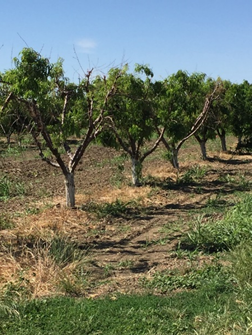 Many orchards had standing water from January through mid-May. In other orchards, ditches overflowed with nowhere to pump water out. Unlike previous years where floods occurred from levee breaks, such as 1986 and 1997, trees in 2017 had a much longer exposure to waterlogged conditions. We have written previously about flooding damage generalities and past flood events. 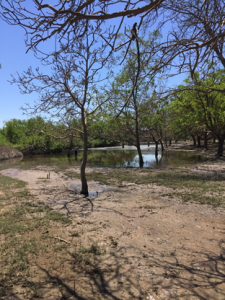 Part 1 of this article details our observations on flooded orchard damage as of early June and current research plans; Part 2 will explore management considerations; and Part 3 will provide an update on potential resources available for flood damaged orchards. 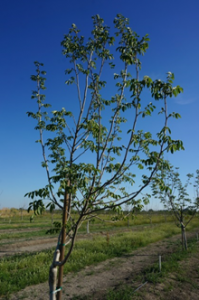 By early June 2017, many flooded or waterlogged walnut and peach orchards exhibited tree death or severe decline, but assessing losses should be delayed until the end of summer when the extent of damage will be clearer. There may also be effects seen next year and subsequent years. 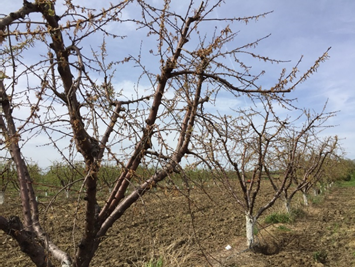 Since peach trees start blooming in late February and are very sensitive to wet conditions, the first peach tree damage was noticed in late March/early April. Walnut root activity begins in later spring, with waterlogging symptoms appearing in early May. Some peach and walnut trees had healthy crowns and roots in the top foot of soil even though they were leafing out late or had leafed out and died back. These symptoms were caused by waterlogging of deeper roots where soils were still saturated. In previous years, flooded trees usually had dead crown tissue and rot of shallow roots from waterlogging and/or Phytophthora. In early April, after a peach orchard on heavier soil bloomed and started to leaf out, shoots began to die (Photo 1). However, some buds (mainly on larger limbs) tried to push. Once the soil dried out, the trees began to recover (Photo 2). This illustrates why it is best to wait and leave trees through the summer to more fully evaluate potential recovery. Photo 1. Peach collapse from waterlogging taken April 5, 2017. Photo: J. Hasey. Photo 2. Same orchard on June 1, 2017 with new shoot growth after soil dried out. Photo: J. Hasey. Preliminary results show Phytophthora in several locations where we sampled surface water. In river bottoms where walnut trees were partially submerged for prolonged periods, we isolated Phytophthora species from bleeding root and aerial trunk cankers first noticed around mid-May (Photos 3 & 4). Photo 3. 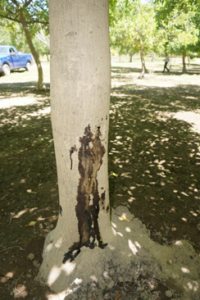 Bleeding cankers associated with aerial Phytophthora on a river bottom walnut tree (taken on May 23, 2017). Photo: J. Hasey. Photo 4. 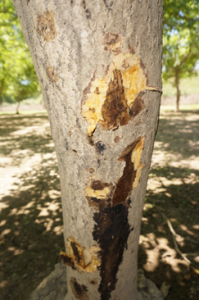 Bleeding cankers associated with aerial Phytophthora on a river bottom walnut tree (taken on May 23, 2017). Photo: J. Hasey. 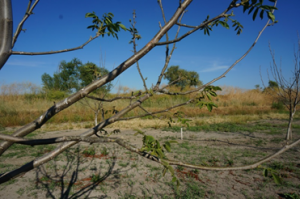 In a young Chandler orchard on RX1 rootstock, a third of the orchard had seepage from January to early May, whereby only the tops of the berms were not submerged. Flooded trees leafed out about a month later than those not flooded. Some trees are struggling while others are continuing to leaf out and grow (Photos 5 & 6). Photo 5. Late leaf out of waterlogged Chandler on RX1 rootstock. (taken on May 23, 2017). Photo: J. Hasey. Photo 6. Late leaf out of waterlogged Chandler on RX1 rootstock. The tree on the right appears to be recovering as soil dries out (taken on May 23, 2017). Photo: J. Hasey. Our approach is to study two potential problems of concern: 1) diseases caused by Phytophthora and 2) impact of waterlogging on the root system. We know the “water mold” Phytophthora is found in surface water and infested soils. In May, we sampled water in the Sacramento and Feather Rivers, in swales of standing flood water in the Feather River bottoms (Photo 7), and in seepage water from under levees along both rivers for the presence of Phytophthora. Photo 7. Walnut in foreground collapsed in a swale of flood water that we sampled (background) in the river bottom (taken on May 23, 2017). Photo: J. Hasey. We sampled several walnut trees with symptoms of aerial Phytophthora and examined the crown and upper roots on declining trees. We will monitor these sites through the summer and backhoe trees to examine root systems. We will study the impact of long-term flooding from continued seepage on walnut root health and tree water status. Check back on Monday and Wednesday for Part 2 (management considerations) & 3 (resources for flooded orchards).